NewSouth Window is committed to delivering the finest and most energy efficient windows for your home and office. Their windows are custom designed specifically for the tough, Florida weather conditions. And, at NewSouth you get factory direct pricing with easy, low payment plan options so that you can afford to buy now. Don't be fooled by companies that advertise replacement windows for $ 200 or less. Those windows are not energy efficient, do not keep out the sun's ultraviolet rays, and do not provide a barrier to protect your family from the elements. Florida based NewSouth Window builds your custom-made window in their own Tampa factory. Factory direct means they cut out the middle man, eliminate the mark up, and provide Florida's very best windows at the very best price. NewSouth Window founders Earl Rahn and Dan Ochstein have nearly a half century experience building the nation's best windows. Their team has created a window unique to Florida that protects against the elements, keeps out the heat and UV rays, and at the same time, dramatically improves your home's curb appeal. What's more, you get an unconditional warranty on manufacture and installation - for life. Plus, that warranty is transferrable to the next owner! In short, total peace of mind that makes your buying decision easy! 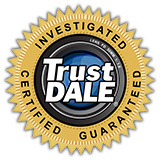 TrustDale finds your exceptional experience begins with your call answered by an informed customer service professional. I have personally observed this dedication. Earl, Dan and their team of Florida professionals are dedicated to not just meeting, but exceeding your needs and desires. NewSouth removes your concern by guaranteeing your window - unconditionally - for life. TrustDale is proud to offer the Make It Right Guarantee, but equally confident you won't need it because NewSouth Window is just that good!